There’s a ‘new kid on the block’ in the world of practice management software and if you’re looking to increase sales, organize your office to a ‘T’, and have access to new business development tools, you’ll want to check out the latest player in the Canadian optical market: Acuitas by Ocuco. While relatively new to Canada, having launched in May 2012, Ocuco is the number one software developer for optical practices in Europe and the second largest optical retail software company in the world. The company’s expansion into North America from its home base in Ireland adds to its already successful presence in 36 countries including the UK, Italy, France, Spain and Australia. As thought leaders in the industry, Ocuco has 17 years of solid growth under its belt, with over 100 employees, including 40 developers. The company has invested over $20 million in R&D, making it the practice management suite leader in the industry. Ocuco software has been installed in over 5,000 locations world-wide since 1997. It serves independent eyecare professionals (ECPs), optical retail chains of all sizes, as well as optical lens manufacturing labs, for the fulfillment of all aspects of the patient’s journey. Customers include Vision Express in the UK and Salmoiraghi & Vigano in Italy. In each market, Ocuco has ‘localized’ its software so that health insurance plans, whether public or private, and the local vernacular are incorporated. Integration is the name of the game for Ocuco’s Acuitas, which was the first paperless practice management system with full integration of all imaging equipment and data systems. “Our customers can seamlessly manage the entire patient journey from marketing and appointment booking, through to exam, dispensing, order collection, recall and e-commerce,” notes Walsh. “All types of clinical systems are integrated for automated validation, electronic submission and reconciliation of insurance claims. “Business Intelligence (BI) reports are a key feature of the system and essential to the survival of any business,” says Walsh. “These BI reports include revenues, exam outcomes, sales figures, stock availability, sales and brand performances, recall trends and return-on-investment (ROI). With 65 BI reports in Acuitas, there’s no more guessing about how your business is performing,” he adds. 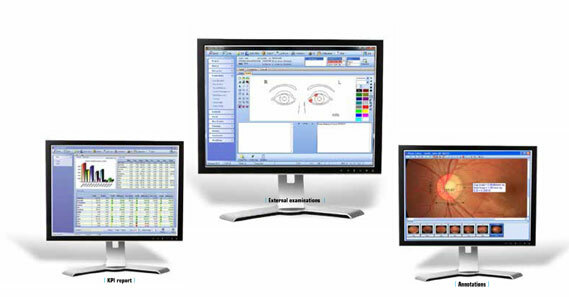 Personalized demonstrations of the software are available via the Ocuco website at: http://www.ocuco.ca/demonstration.html. “I’d rather take a potential client through the demonstration personally, rather than conduct group webinars,” says Walsh. So the ‘new kid’ is in fact, a well-seasoned global software developer for the optical community. Who knew?